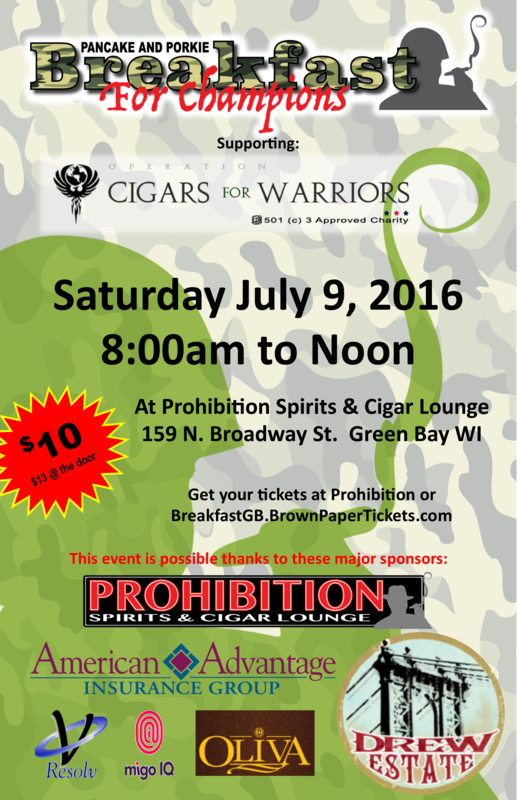 Green Bay, WI – July 5, 2015 – There is no better place in the world to get an opinion on the current happenings in government than a cigar lounge, and Prohibition Spirits and Cigar Lounge is no different. “Seldom does a day go by when politics are not a topic of conversation, and on a typical day there will be at least three sides to the argument,” says Luke Russell, one of the owners of Prohibition. However, with all the arguing and debating of who is right and who is not, everyone agrees upon one thing: our right to sit in the lounge and smoke and debate politics has come at a high cost: the millions of all those who fight to gain and maintain our freedom. On July 9, 2016 from 8:00 am to Noon, the patrons of Prohibition and other community members will be joining together to send a thank you to those who are deployed overseas. This Saturday, instead of pontificating on the social acceptability of smoking or arguing on the disasters happening in Washington, stop by and enjoy a breakfast, the proceeds of which will go to purchasing cigars for our troops. During the breakfast, Prohibition will also be donating a box of cigars for every box of Drew Estate cigars sold. There will also be raffles and a cigar donation box for anyone that wishes to donate from their collection. This breakfast is in cooperation with Operation Cigars for Warriors (http://cigarsforwarriors.org/). To make the event extra special, Storm Boen, the Chair of Operation Cigars for Warriors will be in attendance. This country is made up of, and defended by people of a whole host of races, colors, and creeds. It is what makes us Americans. So whether you are black or white, man or woman, Hispanic or Asian, don’t forget that the cost for our freedom is still being paid. “As for me, I’m going to light up a cigar and sit in silence as I thank God for those that serve, and pray that I live a life worthy of the sacrifices being made to protect it,” says Russell. Stop down to Prohibition and offer your sincerest thanks to all who serve by sending them a cigar or two. Prohibition Spirits and Cigar Lounge is the only cigar lounge in the Green Bay area. We invite everyone to enjoy life. When you walk through our doors you will find great drinks, fine cigars and good friends. Everyone is welcome, and you are only a stranger here once.